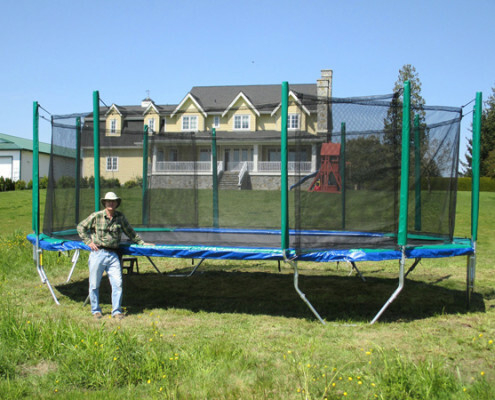 Vikan Octagon Trampolines – Biggest Trampoline in the World! 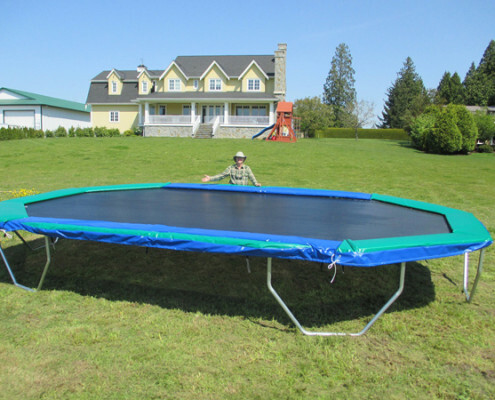 The Goliath is our biggest trampoline, and maybe the world’s largest private outdoor trampoline. This 24 footer is so dang big it might need it’s own zip code. Perfect for people with big backyards, big hearts and a big need for big fun. This is our “go big or go home” model. 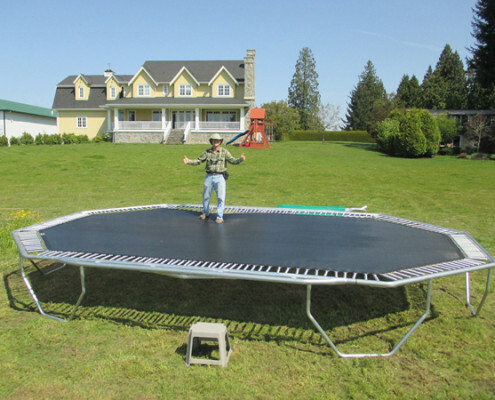 Excellent choices for those wanting the biggest and best trampoline ever built. The Goliath II might be the kid brother of The Goliath but this is still one big kid brother. Maybe you don’t have a field out back but still got a large yard and looking to keep the whole family (and neigbourhood happy), this is the one for you. Kind of like having your own trampoline park right in your own backyard. Both of these large trampolines come with the Vikan Massive Bouncing Area for plenty of fun and the biggest bounce for your buck. 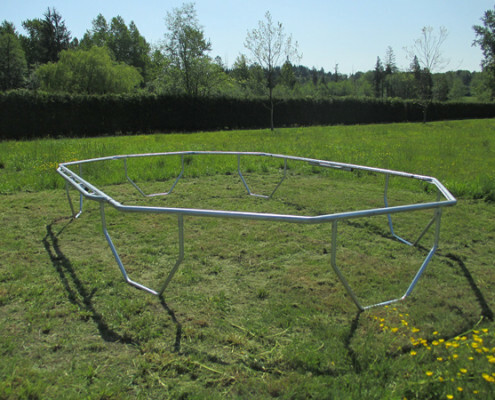 For additional safety and peace of mind, our octagon trampolines are compatible with select custom fitted Vikan trampoline enclosures. 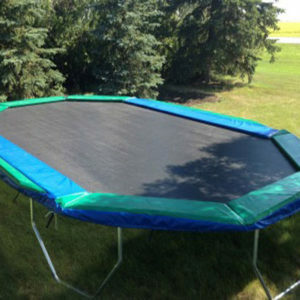 We also have trampoline repair kits available for sale as well. The Goliath is the largest backyard trampoline in the world. The slideshow, to the right, shows Ivan, the Trampoline Man, setting up this big trampoline in this big beautiful backyard. Big on Bounce…Big on Safety. 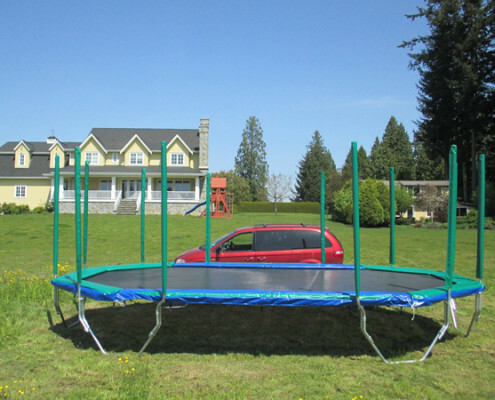 Vikan’s octagon trampoline frame with equally-spaced high-performance trampoline springs allow uniform spring-stretch and frame-stress, resulting in a smooth, comfortable bounce. This attention to detail ensures a natural tendency for the trampoline to work the jumper toward the center of the mat, allowing for a safer, more controlled and predictable bounce. 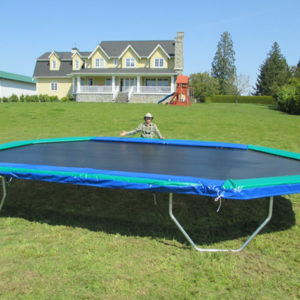 Quality sets Vikan Trampolines apart – meticulously crafted in the USA/Canada, our Vikan trampoline jumping mats are made of heavy duty polypropylene fabric, using a thicker, more open weave than the competition. This allows for more air flow and less air resistance. That translates into a superior, softer, smoother bounce, which allows jumpers better control and performance. We also offer a more textured mat finish to minimizes slipping — our trampoline mats are not even slippery when wet! 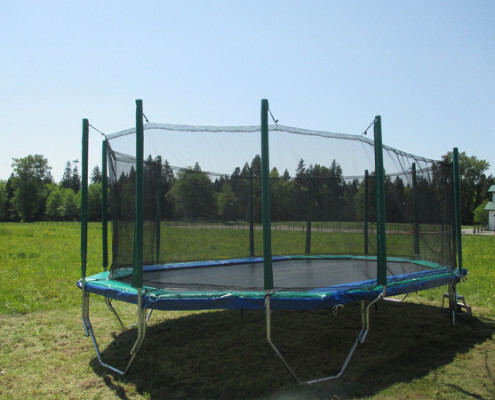 You can even add a Vikan trampoline enclosure for additional safety! 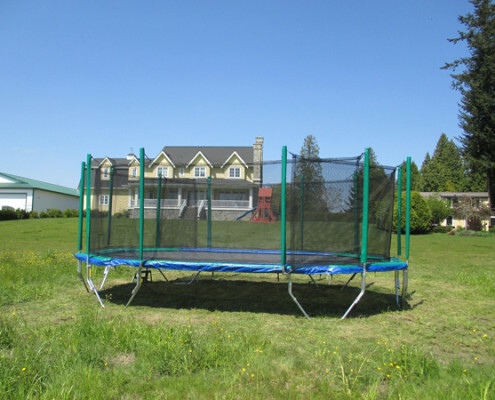 Trampolines across Canada and the USA. We've shipped to Surrey, Langley, Kamloops, Kelowna, St. John's, Nanaimo, Kingston, Toronto, Montreal, Moncton, Ottawa, Edmonton, Kitchener, Quebec City, Calgary, London, Winnipeg, Halifax, Saskatoon, Regina, Vancouver, Victoria, Prince George, Washington, Oregon, California, New Mexico, Montana, Nevada, Colorado - to name a few.